by Shakespeare in LA in Los Angeles Tags: Huntington Library, Independent Shakespeare Co.
…as well as primroses and cowslips, mentioned in A Midsummer Night’s Dream, Citrus aurantium, the ‘Chinotto’ orange, mentioned in Much Ado About Nothing, and the “Apothecary Rose,” the red rose of Lancaster and the white Rose of York, from Henry VI. 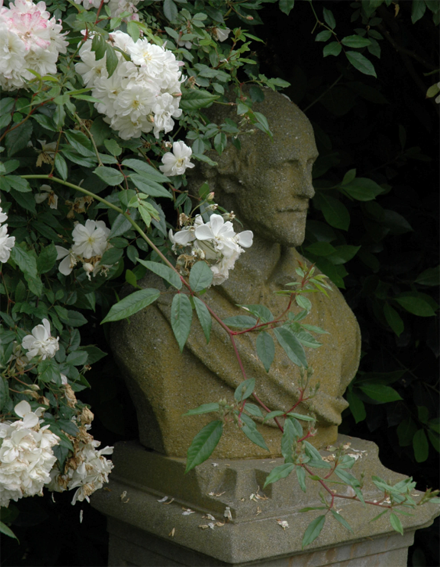 Before you leave make sure you get a photo with the bust of William Shakespeare among the green. If you visit on April 12 from 11:00 am – 2:00 pm, you can see Independent Shakespeare Co. perform scenes from some of Shakespeare’s best-loved plays in different locations throughout the grounds during Shakespeare in the Gardens. The family-friendly event includes interactive workshops and craft activities for exploring Shakespeare and his world. General Admission into the Huntington is the only cost. Another unique program offered is Shakespeare at The Huntington, a unique, two-week institute designed primarily for 7th-12th grade teachers of English and Drama that focuses on teaching Shakespeare through performance. The course features an international faculty of scholars, educators and theatre professionals, and takes advantage of one of the world’s great libraries and research centers, its extraordinary gardens and art collections. Topics covered include scene study, verse and text work, voice, movement, classroom pedagogy, theatre history, and criticism. Attendance at selected plays is required during the two-week course. Outside reading and a final evaluation are also required. The theme for the workshop is “We Have Heard the Chimes” Grace and Aging in Shakespeare. The selected texts are: Antony & Cleopatra, Henry IV, Parts 1 & 2 and King Lear. The deadline to submit an application is May 20, 2014 and those accepted into the program will be notified by June 6, 2014. Tuition is $250, due by June 30, 2014. Enrollment is limited to 24. For more information, contact Audrey Durden, 626-405-2127 or adurden@huntington.org.